Being the beginning of Masters week, THP wanted to do something a little different for our WITB segment sponsored by the THP Tour Spot. Normally we focus on 1st round leaders, or players with a few oddities in their bag that stand out, but with today’s first round winding down, we wanted to focus on something else. A player who won this very tournament back in 1987 and is currently playing most of his golf on the Champions Tour. He also happens to be just +1 and right in the middle of the pack. What stood out for us is the way he was hitting the ball today. On a course that will play long for most Champions Tour players, Mize was hitting his new Cleveland Mashie hybrid incredibly well today. 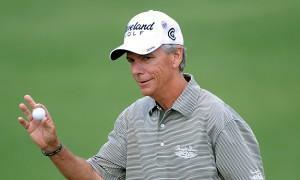 Here is a look at WITB for Larry Mize at the Masters. You can find out what is in your favorite player’s bag by requesting it here. thanks for the info, amazing that the 588 wedges are once again in a bag of a tour pro. Cleveland please re-release those wedges! I’m amazed that Larry still hits an 8.5* driver, then goes a stout 3w before following up with an M2 Mashie. Makes me wonder… then the CG1’s and a 56* wedge. Can I volunteer for that interview? I’ll pay for my flight down, meeting Larry Mize would be a dream all its own. Cool to see the pro’s getting on the Mashie wagon!! Thank you for the info, nice to see the masie getting love on tour!! Thanks for the info THP! Pretty cool to see a mashie in play. More 588s in the bag! I wonder where normal golfing mortals can get these with conforming groves? Thanks for all the great info THP! I appreciate this feature so much, thank you THP for all of your hard work. Thank you for taking the time to post WITB’s for everyone to see! Thanks for getting this info for us! I really love this segment. What I love even more about this specific one is that you gave us something a little out of the box as it pertains to most peoples requests for WITB info. Thanks THP for making this one a little unique.